Mike and Janet McManus stand on the land they promised Karl Kiessel that they would never develop. The permanent protection of 141 acres ensures that their promise to Karl will always be kept. The McManus land has what it takes to produce prime fruit. Plus it contains wetlands that help to maintain the clean waters of Lake Leelanau. Thirty six years ago, Mike and Janet McManus made a promise. 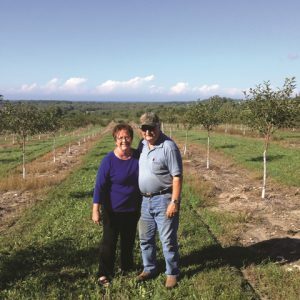 They were about to purchase Karl Kiessel’s farm along Eagle Highway—an ideal fruit-growing site overlooking Lake Michigan. “Karl was a very nice man and he could have sold that 80 to anyone, but we had this verbal deal,” says Mike. “He disliked the idea of houses built on this land.” And, Mike and Janet were of the same mind. A handshake at Karl’s kitchen table sealed the agreement–as binding as any legal contract, says Mike. He and Janet kept the promise. But they worried about who would keep it after they were gone. In addition to preserving some of the best fruit growing land in the county, the McManus conservation easement also protects wetlands in the Lake Leelanau Watershed and takes in frontage along Houdek Creek. 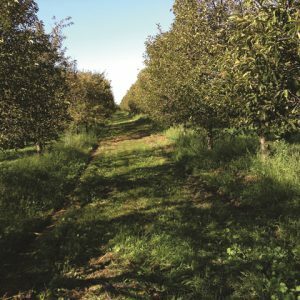 More good news: the land links up other preserved lands, including the Bardenhagen and Korson family farms, creating a working agricultural corridor. With its stunning views, Mike says developers have come calling over the last 20 years. The development potential, the connectivity to other farms, the wetlands, the superb soils and sloping site are all reasons to ensure its protection. “It has what makes stone fruit farming possible—and so much more,” says Sam Plotkin, Farm Programs Manager. On a stunningly beautiful late September day, Mike and Janet talk about their 52-year marriage and how they got their start. A panoramic view from their home off Alpers Road takes in part of their farm and Lake Michigan beyond. When they bought the land, they had no idea that the view existed. Mike had grown up in a big family on a cherry farm on the Old Mission Peninsula; his four brothers are fruit farmers in the Grand Traverse area, including the longtime Michigan senator, George McManus. Janet’s father owned a clothing store in Traverse City. Both sets of parents were “products of the Depression and carried that ghost on their shoulder,” says Mike. Mike and Janet married young. “She put me through college,” he says. After a year in Flint, he landed a job at Traverse City Central teaching history. Janet worked full time for the company known as Greenstone today that serves the farming community. They lived in Garfield Township and raised two children there, Michelle and Jim. Farm chores ate up evenings and weekends. They burned up the miles commuting; before long they converted old migrant quarters into to a makeshift campsite. While Mike tended trees and managed crews, Janet kept the books. It wasn’t until 2004 that the couple actually built their home and moved to Leelanau. 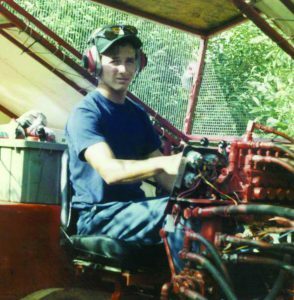 But for 22 years Mike served on the board of the Northwest Michigan Horticultural Research Station Foundation, the group that built the station and brought agricultural researchers to Leelanau. 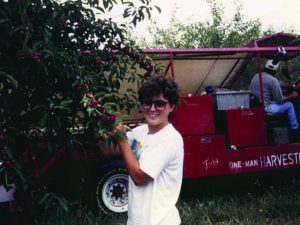 Part of their plan is ensuring that their land will always be available to farm, whether it’s a member of their family or another young farmer, who, like them, dreams of being a cherry grower.